“Well, show me your swing set.” Jack stood and set his empty glass on the coffee table. “Even if you can’t do gymnastics today.” He grinned at Sarah and to his immense gratification, she actually smiled back at him. “Okay.” She skipped out of the room and he trailed behind her, through the kitchen to the back door. A tidy patch of lawn and a few pots of colorful flowers made up Brittany’s yard. 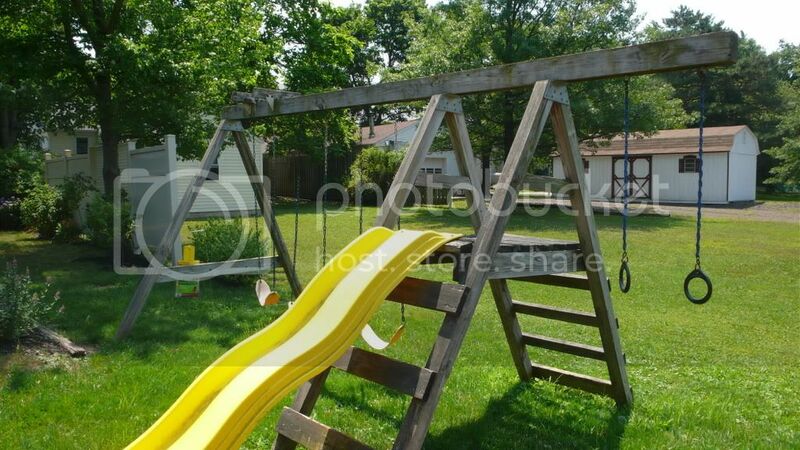 A large swing set with a yellow plastic slide dominated the small space. Sarah plopped herself down on a seat and started to swing back and forth. “I guess if I sat on that swing I’d probably break the whole thing.” Jack eyed the other seat doubtfully. “You calling me fat?” He made his voice teasing and was glad to see her smile again. ` “Yeah, he did. I helped, but I probably caused him more work than I actually helped.” He laughed. “I don’t have a dad,” Sarah said matter-of-factly. “Not here, anyway. Mom says I have a dad, but he lives too far away for me to see him.” She gave a gusty sigh. “I wish he was here so he could build a tree house. Right there.” She waved a hand at the live oak in the corner of the yard. Jack’s heart squeezed. Oh God. If he opened his mouth something was going to come out. He closed his eyes, tipped his head back while he got things under control. Sarah rolled her eyes. “A lot,” she said, and her young cynicism dug into his heart. “Everything okay out here?” Brittany’s voice came from behind him and he could hear the note of anxiety. He turned and smiled reassuringly. Brittany shushed him, apparently afraid Sarah would overhear. “We’ll talk later,” she whispered, frowning. He nodded, and they all went back inside. He felt Ally’s gaze on him as he walked back into the living room, her beautiful hazel eyes full of compassion and curiosity. He shot her a smile, sat back down again. “Brittany and I were getting caught up,” Ally said cheerily. “Wanna see my room?” Sarah invited. “Oh, Sarah...” Brittany began, but Jack stood again. “You can come too, Ally,” Sarah invited her. Ally followed them down the hall to Sarah’s small pink and white room. After seeing her doll collection, and after she’d modeled the pouffy white tutu she’d worn in her ballet recital, Jack, Ally and Sarah returned to the living room once again. “I guess we should go,” Jack said finally. He heard her small voice calling a goodbye over the television she’d already switched back on and he grinned. Jack started the car and headed for the freeway again. Hell, no. He’d had bombs raining down around him, explosions ripping up the ground, seen people hurt and killed, watched his friend grieve the loss of his young family, and he’d done it on his own. But right now...he didn’t want to be alone. “I can.” He kept his eyes on the road. She fell silent again, and when he shot her a sideways glance, she was gazing out the side window. The silence in the car thickened, making his gut roll until they got to Ally’s home. They climbed out of the car and stood there for a moment, looking at each other. They both smiled slowly. He touched her hair.